As with any other part of the body, the skin loses some of its functionality over time. So, as we age our skins get drier, thinner, more fragile and less elastic due to several years of wear, exposure to UV rays from the sun, gravity, and other factors. While these skin changes that come with ageing are inevitable, it is still quite possible to have a smooth and healthy skin even at old age. It’s all down to skin care. We’ve bought and tested all of these, here’s what made the cut in the best lotion for elderly skin. These have been carefully selected based on effectiveness, suitability for seniors, real buyer opinions, brand trust, and other important factors. There are a number of body lotions out there in shelves and stores but these have the best effect on elderly skins. First on our list is the Nurture My Body Organic Vitamin C cream. This body cream, as suggested by its name, is made to address the major problems associated with aging skin. It reverses the effects of aging on the skin by getting rid of wrinkles and catering well for dry and sensitive skins. It is a bit pricey when you compare it with other anti-aging creams but this price is commensurate with its quality. It is organic and is made from natural ingredients. It contains zero synthetic chemicals. It is infused with organic botanicals and vitamin C. These materials (organic shea butter, jojoba, and avocado) prevent free-radicals from damaging the skin. They also stimulate collagen production which effectively reduces wrinkles and moisturize the skin too. It moisturizes the skin without leaving it greasy. Using it regularly will improve the elasticity of your skin and give you a youthful glow. It comes in a cylindrical glass bottle which is packaged inside a recyclable cardboard box. It doesn’t increase the toxicity of the environment. It is good for the neck, face as well as other parts of the body. However, you’ll have to gently massage it in an upward motion when rubbing it on your face and neck. It gives the body a mild, floral-citrus smell. There’s a fragrance-free version though, if that’s what you prefer. The Retinol Moisturizer Anti-Aging Cream is an anti-wrinkle lotion for the face targeted at getting rid of “crows feet” (wrinkles near the eyes), circles and fine lines on the face. Produced by InstaNatural, it contains over twelve ingredients aimed at moisturizing the skin and reducing skin aging. Testimonies abound about how it thickens the skin, makes it firmer and eradicates wrinkles. The outstanding ingredients in this cream are Vitamin A (Retinol), Vitamin C, and green tea. These Vitamins are known to slow down skin aging. Vitamin A in addition helps to decrease blemishes on the skin. These ingredients provide antioxidant benefits which results in a beautiful, soft and radiant skin. It also helps to reduce the aggressive effect of UV rays from the sun on the skin. It removes dead skin and unclogs pores. This gives you a fresh feeling and a clearer, smoother, and more flawless complexion. The moisturizing effect is top notch too. Armed with Safflower Oil, Hyaluronic Acid, and Shea Butter, it hydrates the skin and gets rid of dryness. It works on a wide range of skin types. It’s recommended that you use it on a clean skin after using applicable serums. The Lavender Oil Facial Moisturizer is for use on the face alone and is suitable for both men and women. The whitish cream comes in two scents- lavender and citrus, so you can go for the one you prefer. This scent isn’t too strong though and you can detect a faint smell of shea butter in it as well. It is quite effective in getting rid of wrinkles and lines on your face as well. It is made in the United States and packs a number of fatty acids which help it work its magic. Produced by Thena Natural Wellness, it is one of the best anti-oxidant moisturizing face creams on the market. The major ingredients in the cream are organic shea butter, hyaluronic acid and Vitamins C and E. These contribute to refine, restore and rejuvenate the skin. It also contains titanium dioxide which is a natural sunscreen. It is creamy and the texture is lovable unlike other moisturizers which are watery. It also settles on the skin nicely. You can use it as your day or night cream. It keeps away wrinkles and is great for sensitive dry skins. The Alina Skin Care Serum is another top moisturizer which effectively removes wrinkles and reverses aging of the skin. Manufactured by Alina Skin Care incorporation, it is 100% clear, odourless and free of impurities. It comes in a cylindrical tube with a pump and weighs an ounce. Basically, it’s a moisturizer which nourishes and replenishes the skin in addition to getting rid of wrinkles. It contains Alina’s proprietary AV8 Anti-Aging Complex which, when used on a daily basis, gives the skin a number of long-term benefits. It’s touted to be made from the highest quality anti-aging hyaluronic acid available with a unique blend of apple and grape seed extracts as well as natural macadamia seed and squalene which are omega fatty acids. It also contains Vitamins C, B and E along with green and white tea extracts for protection against free radicals. Organic aloe and jojoba are also part of the ingredients in this cream. These two tend to project a calming and soothing feeling on the skin. It contains 5 different antioxidants as well as a number of moisturizing agents. Users usually notice a distinct difference immediately after the first application. The Olay Regenerist Regenerating Serum is an advanced anti-aging serum which comes in a thin 50ml cylinder. It works effectively to reverse the effects of aging on the skin, especially for women. It plumps, firms and corrects. According to Olay, its effects on wrinkles are noticeable after the first day of use, making you look younger over time. A 17-year research in which over 70,000 genomic samples were analysed was undertaken to discover what makes women look naturally younger. The knowledge gained from this research informed the production of this serum. There’s a safety warning though: it must not touch the eyes. If this happens the eyes must be rinsed immediately. This serum is powered by skin-plumping Amino-Peptide Complex II, which firms and smoothens the skin, getting rid of wrinkles quickly such that in 14 days you’ll notice that your skin’s renewal rate has improved substantially. Its lightweight anti-aging formula delivers moisturizing ingredients 10 layers deep into the skin. This speeds up the disappearance of wrinkles on the skin. It also contains key anti-aging ingredients such as carob extract and micro-sculpting serum which aids surface cell regeneration. It comes in four options- fragrance free micro-sculpting serum, fragrance free regenerating serum moisturizer, micro-sculpting serum and regenerating serum moisturizer. 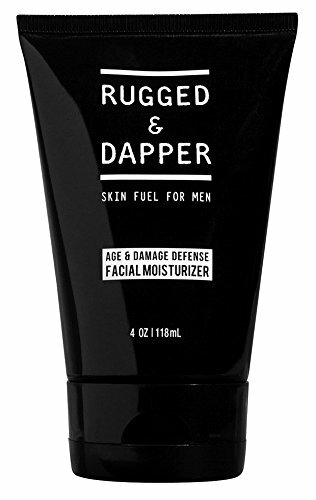 The Rugged & Dapper Face Moisturizer for Men is another fantastic cream for elders although it is a face moisturizer meant for men only. You can say it’s a multi-purpose anti-aging face lotion and aftershave. It comes in a 4oz tube and won’t put a hole in your pocket. Although it helps repair skin damage due to lasting exposure to the sun, it doesn’t contain Chemical Sunscreen protection or SPF. This lotion can be used as a face moisturizer or an aftershave. It is made from organic materials found in nature. The main ingredients in this cream are aloe vera, hyaluronic acid, green tea, jojoba oil and shea butter. These help it to revitalize and moisturize aging skin, getting rid of dryness. They also aid the production of collagen to nourish the skin and combat acne and breakouts. It is fragrance and shine free. It gets quickly absorbed by the skin (in less than 2 minutes). It feels light on the skin and lasts all day. It doesn’t clog pores on the skin. It is also good on sensitive skin and doesn’t leave the face oily. Unlike other creams which come in a pump container, it comes in a tube. So no pump trouble. Aveeno has been around since 1945 so it won’t be out of place to assume that they know what they are doing when it comes to skin care products. The Aveeno Daily Moisturizing Body Lotion comes in a pump container and is as effective as the other 6 anti-aging creams despite costing less than most of them. Its major selling point is the protection it gives the skin. Aveeno body lotion is known to cater for chapped, cracked or windburned skin. In addition to this, it protects irritated skin and relieves dryness, making the skin feel fresh, smooth and hydrolyzed all day. It comes without any fragrance and isn’t suitable for oily skins. For some reason it does well in keeping eczema in check. Quite a number of people have attested to this. The active ingredient in this lotion include 1.2% dimethicone which offers the majority of the protection it gives the skin. Other ingredients include water, glycerin, distearyldimonium chloride, petrolatum, isopropyl palmitate, cetyl alcohol, avena sativa (oat) kernel flour, benzyl alcohol, and sodium chloride. These don’t play an active role but they’re pretty important. It can be used on all parts of the body. It gets absorbed into the skin quickly. Whether you are buying for yourself or for someone else as a gift or for other reasons, there are certain things you should consider whenever you want to buy a skin cream for seniors. Are you pro-green? Do you prefer your cream be completely organic or not? Would the product being environmental-friendly inform your decision? Make sure the product contains ingredients that reverse the effects of the sun on the skin. UV rays from the sun are the major causes of aging skins. If you’re all about moisturizing lotions, ensure that the moisturizer is right for your skin. Check the ingredients to ensure you aren’t allergic to any of them. Go for creams with antioxidants. This is an added bonus. Creams containing antioxidants help absorb free radicals which causes skin damage. Vitamins C, B3 and E are particularly effective as they get absorbed into the skin quickly than others. Most creams which contain vitamin A are very good on the skin. Apart from getting rid of free radicals, vitamin A also helps to increase the production of collagen fibers in the skin. The more collagen fibers your skin produces the more elastic it will become, leading to the eradication of wrinkles. Try sticking to one product. Using multiple creams will not bode well for you and in most cases leads to skin irritation. No skin care product works well for everybody. Test a new product on a patch of your skin before applying it all over your face or body. Put a small amount on the back of your palm or the side of your neck and leave it on for a day. Check periodically to see how your skin is reacting to it. If you develop a rash or it irritates your skin, you don’t want to use it on the rest of your body. Check your pocket. How much money are you willing to spend on a particular anti-aging body lotion? These anti-aging lotions all reduce wrinkles from the face and skin but they do so in varying degrees. Some have added functionality like toning and moisturizing to make you look younger and fresher. Also, some are face creams and others can be used on all parts of the body. Picking one depends on what you have in mind and what you want for your skin. So, choose what’s best for you and keep looking young.